As her third album comes to fruition, the songs which were held back until now kick out with a vengeance into the collective consciousness. ‘Attitude is Everything’ is described as Ella Jo’s Gothic-Neo-Folk contribution to popular music. Reading the lyrics one can see why. Embedded in the variety of songs present on the album are angsty lyrics that are intensely personal – although the actual issues are mostly hidden in the poetry. The lyrics deal with the nitty-gritty which we can all relate to, without giving personal experiences away. In fact, the depth of the poetry contained in the lyrics of both contributing songwriters (Ella Jo and past associate Terry Bartlett), are far from depressing. They are reflective, dealing with human struggles in the process of finding identity and making ones own way in the world. As with most Gothic material, there is intellectual influence from Punk through to Electro music, although, happily, total morbidity has been left out. There are ten songs on the album, and at times one may sense passing agony in the lyrics, although some songs are more about poking fun. This collection of lyrical poetry touches the psyche with a refined etiquette already hinted at in the previous work. Best appreciated at midnight by candle light, in a heightened emotional state, with dark chocolate and a black lace handkerchief nearby! Peeling off the layers behind her music, Ella Jo has given a frank and revealing forward to her new book, Limits Of Milkweed Lyric Book. Not only does the book give all the lyrics to the songs on the album, but she discusses the history and meaning behind the songs in the interesting chapter, The Stories Behind The Songs. 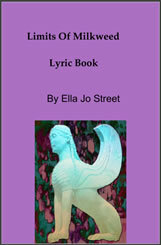 This is actually a book of poetry written by herself and other music partner’s spanning the 1990s and beyond. Further to it’s literary delight, the book is peppered with her original black and white art work. It makes a great accompaniment to her album, but serves as a great poetry book in its own right. The book shall be available by the end of 2009 and will be the first of three books to accompany her three albums. All will be available in our bookstore.